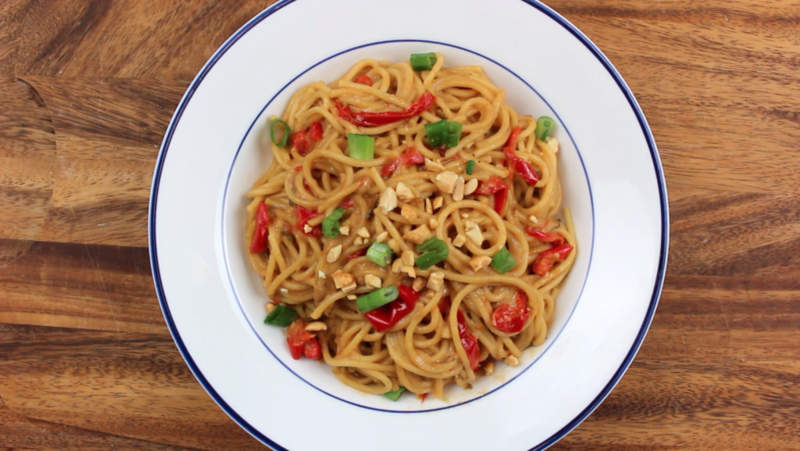 In a bowl whisk together ponzu, rice vinegar, ginger, honey, sriracha, peanut butter and salt. Then, set Instant Pot to sauté and add in sesame oil, sliced bell peppers, garlic and chopped green onion. Pour peanut sauce into Instant Pot and mix together. Then, break spaghetti in half, place inside Instant Pot, and add water. Close the Instant Pot, set to “manual” for 4 minutes and turn valve to “sealing” position. After 4 minutes, “quick release” pressure. Next open the pot and mix the sauce, noodles and veggies together. Garnish with green onions and crushed peanuts, enjoy!